The Grand Palace together with the located in front of it the Big cascade is the main attraction of Peterhof and architectural dominant of the entire palace and park complex. In the XVII - XIX centuries the Grand Palace was the ceremonial residence of Russian tsars, where important events took place, celebrations and receptions, balls and masquerades were held. Currently the Grand Palace is a unique historical and art museum, in the collection of which about three and a half thousand exhibits are collected, including paintings and porcelain, fabrics and unique furniture, as well as personal stuff of Russian rulers. The majestic building is distinguished by several volume parts, the largest of which is the average three-storied part, connected by narrow one-storied galleries with two-storied outhouses. In the eastern part is the Church Corps and in the western part - the "Under the Arms" building. The northern facade directed to the sea and to the Big cascade runs along the edge of the park terrace and stretches for 268 meters. On the south side the Grand Palace is built in the form of a wide letter "P", formed by its middle part and adjoining two three-storied corps. The furnish of the building facades, painted in bright yellow, is characterized by restraint, there is nothing superfluous in it. For decoration are used the elements which are typical for baroque architecture: lush cartouches above window openings, bas-reliefs in pediments and wrought patterned lattices of balconies, white rusts and pilasters. In the center of the roofing is a golden vase of a complex configuration. The dome of the wing - the Church Corps with five gilded tops and the Corps "Under the arms" crowned with a dome with a gilded blazon gives the expressiveness to the building. The monumental building has about 30 rooms in sight. The entrance for guests was arranged in the western part of the building, where the Grand Staircase was located, which has been created by Rastrelli in 1751. 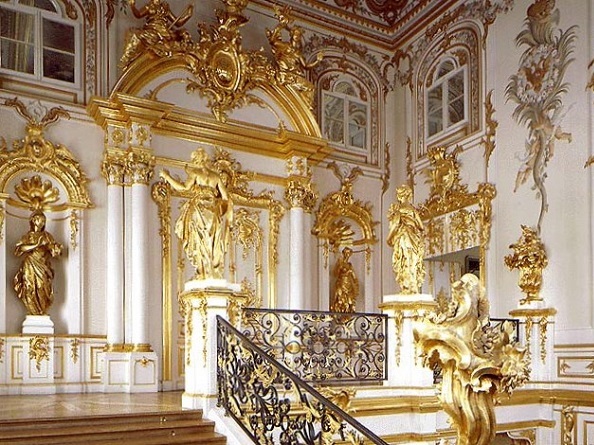 As ornaments of the Main Staircase, gilded statues and carved bouquets, caryatids and rocailles, that is in the style of rococo, cartouches are used. Through the passage rooms, you can go out to the Blue Reception, performed the role of secretarial room, in which daily magazine was, where all the events in the life of the palace were recorded. The western doors of the Blue Reception lead to the Armorial Corps. The Chesme Hall is a waiting room in front of the Throne Hall, where officials waited for the beginning of the reception. 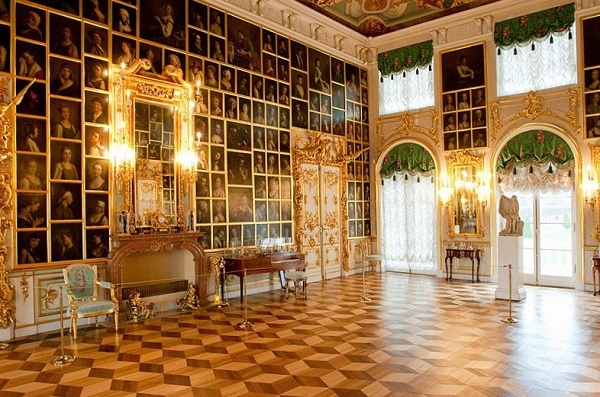 The main decoration of the room is paintings made by the German artist Hakkert, depicting the most dramatic episodes of the Chesma Battle, in which the Russian fleet, led by Count Alexei Orlov, defeated the Turkish fleet. The Throne hall is the most spacious room, designed for receptions, balls and concerts, with an area of ​​330 square meters. Originally this hall sparkled with its splendor, but in 1777 according to the project of Yuri Felten, it was decorated in classical style. Audience Hall was assigned for small receptions of Empress Elizabeth. Its design was executed by Rastrelli and became one of the best works of the architect. The dance hall in the XVIII century was called Kupechesky, its spacious room of 270 square metersoccupied most of the western half of the Great Palace. The windows are arranged in two tiers, a carvingwith gilding, paintings and numerous mirrors were used as trappings. 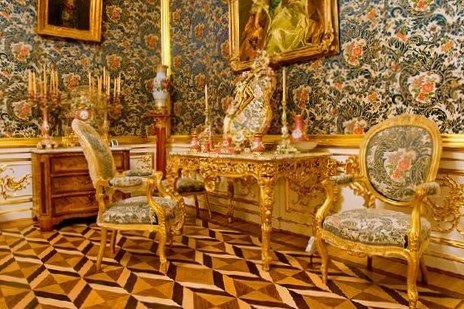 Parquet is made of light and dark oak, maple and walnut.According to the legend, Elizaveta Petrovna ordered Rastrelli to decorate the room richer: "as much as possible overgilding ...", as these apartments allotted for the acceptance of notable representatives of the merchants who loved, in the Empress's opinion, gold. The white dining room was intended for solemn meals and was originally designed by Bartolomeo Rastrelli. 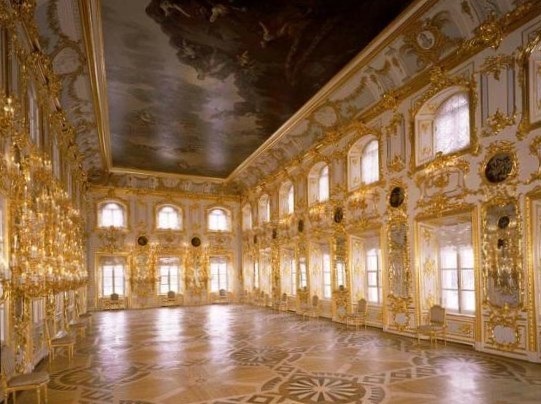 In 1774-1775 Yury Felten significantly changed the hall - its decoration became the complete opposite of the previous one.Instead of shine gilding and light mirrors, the interior was decorated in the strict canons of classicism. In the center of the room is a huge table covered with a white tablecloth and served for 30 persons with a faience service created by the famous English master Josiah Wedgwood. The Picture Hall is the oldest, it was decorated during Peter's lifetime - it is decorated with tapestries by French masters and 16 paintings by Italian artists. At that time it was the largest hall, in the decoration of which took part Nicolo Michetti and Jean Baptiste Leblon. In the middle of the XVIII century the design of the hall was changed according to the project of B.F. Behind the halls of official appointment are the ceremonial rooms of the private half, where only some of the approximate persons could pass. Here there were bedrooms and private offices, dressing rooms and salons, the finishing of which was done according to Rastrelli's plan. The abundance of gilding, mirrors and murals, pendant "mirror" arches with plafond paintings and parquets of precious woods - all these details create an atmosphere of feast. Peter's Oak Office, decorated with oak carved panels, made by the French master Nicolas Pinault was preserved. Among the Emperor's personal stuff, one can see his traveling hours by the German master Johann Benner. Work schedule of the Grand Palace in 2018. The days off are Monday and the last Tuesday of every month. 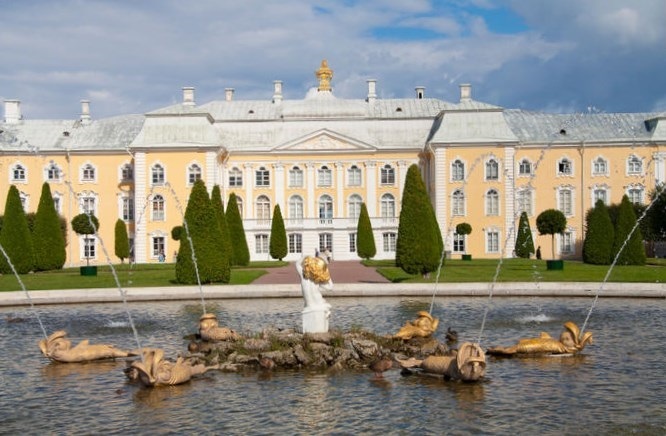 Today, as in former times, the Grand Palace in Peterhof admires its splendor. You will get acquainted with the art of the Russian palace interior of the 18th and early 19th centuries and see how the baroque halls created by Rastrelli are combined with the ceremonial apartments of the period of classicism and rooms with elements of the Rococo style.